Lenovo’s Y gaming series has become renown in the past couple of years and it’s clear why. The new successor to the Lenovo Y50 is the Lenovo Y700, and we can tell by its name alone that there are some drastic changes that we need to address. While the design language remains roughly the same (and just as good), we see some great improvements not only in the design department but in the hardware as well. We are now presented with an M.2 SSD slot, which wasn’t present in the previous generation, which was considered to be a great drawback; we’ve got an updated Skylake CPU and the same GeForce GTX 960M GPU, so the performance advantage is guaranteed as well. However, while the design and performance of the Y50 was great, especially for its price, the Y700 rights some wrongs with the Y50. The design is improved, the cooling system seems more effective (at first glance), we’ve got a better IPS panel (since the first Y50s that came out had lackluster TN screens), and as we already mentioned – M.2 SSD slot. So let’s see if it’s a worthy successor to the Y series. Since we are reviewing an engineering sample, we cannot say what will actually be included in the final retail package, but we are quite certain that the usual user manuals, AC adapter, and charging cable are to be in store. 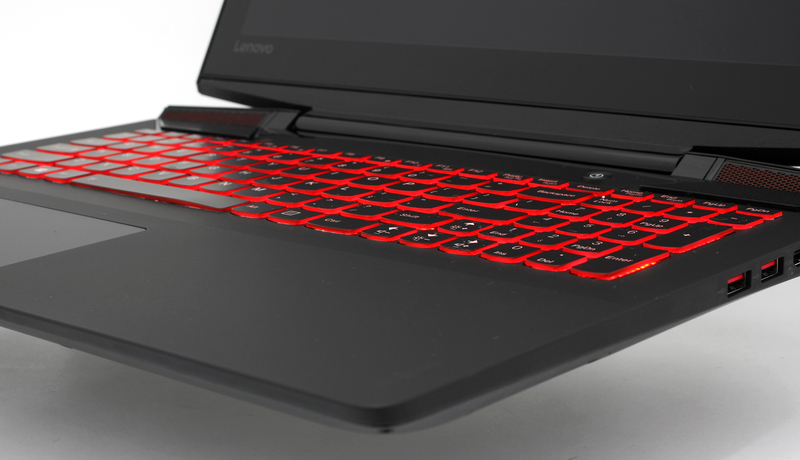 Lenovo has kept it modest with the design changes in the new generation and has kept the same signature appearance we saw in the Y50. Nonetheless, there are a few details that caught our attention and at first glance appear to be another step into the right direction. 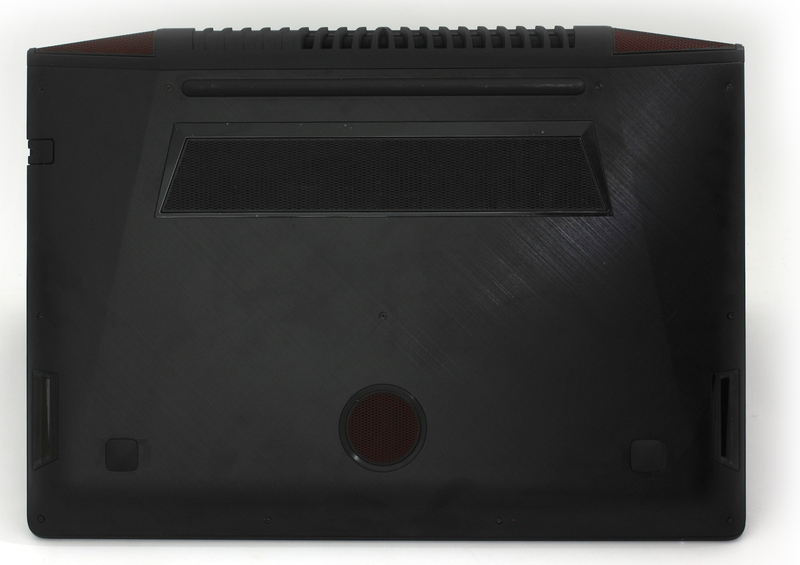 As usual, we start off with the lid that looks absolutely the same as the Y50. It features brushed, black aluminum that feels and looks great, but same as before, it’s a strong fingerprint magnet and doesn’t bend the slightest. 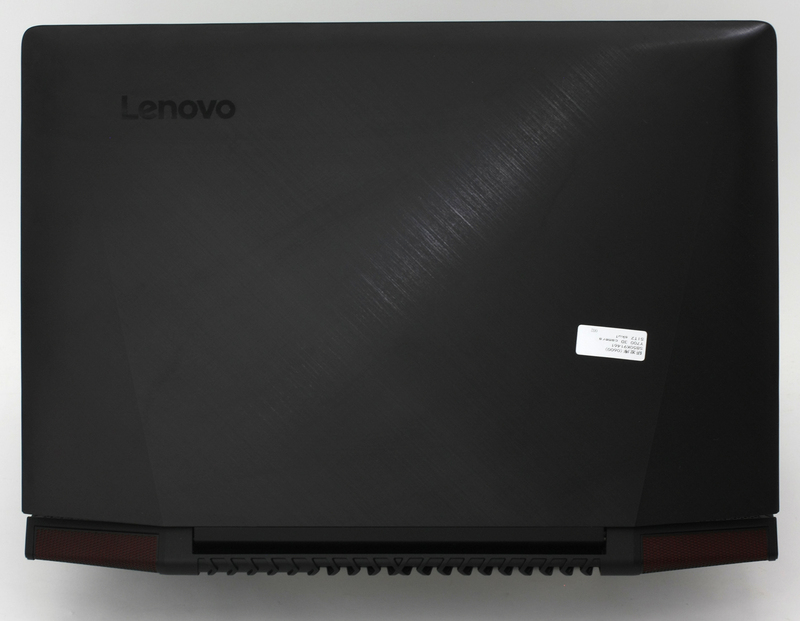 It’s easy to clean, but still… Also, the engraved Lenovo logo has been changed a bit. The hinges feel way better than before and don’t seem to be overly tight, because it’s easy to open the lid with just one hand. On the other side of the lid, we see the 15.6-inch display that has slightly thicker bezels, which are to our liking. The bottom piece has been changed a little as well. The subwoofer has been moved from the upper part to the lower center, and the vent for extra airflow now has tinier grills. It should provide better airflow now since the last generation had this thin cloth-like piece that built up dust pretty fast. And finally, we would like to address the main exhaust vents. Now they are not located between the hinge, but moved at the back of the machine. 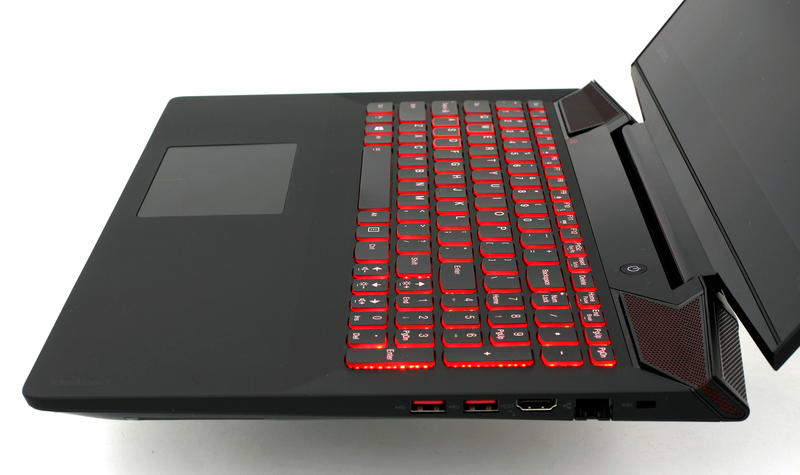 A similar design concept to the Acer’s V15 Nitro Black Edition notebook. We can now expect better cooling performance, but more on that in our “Temperatures” section. As we move around to the sides, we see that the notebook has grown a bit thicker, but not by much (25.95 mm compared to the 24.5 mm). It’s barely noticeable, but the same cannot be said about the weight. It’s now 250 g heavier and it kind of feels heavier than it actually is. Anyway, let’s get back to the sides. Now the aluminum plate connects seamlessly with the plastic interior and doesn’t leave a sharp edge (or even a gap) that the Y50 had. It now feels and looks a lot better. 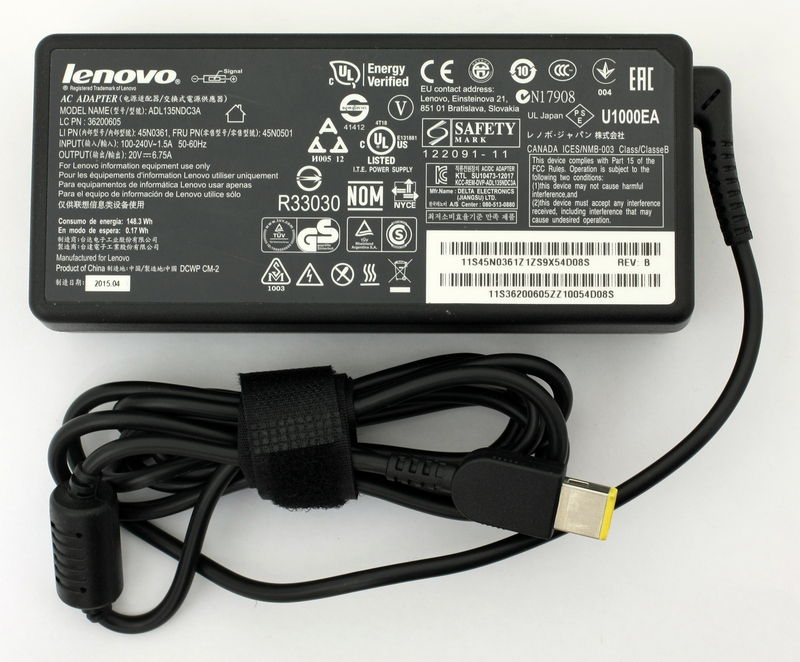 On the other hand, the majority of ports has been moved to the right which could probably prohibit or at least hinder normal usage with an external mouse if you use several USB devices simultaneously – two USB 3.0 ports, the HDMI and LAN port are located on the right, while the left side is populated by just one USB 2.0, DC charging port and 3.5 mm audio jack. The interior looks practically the same as before. Black, matte, soft touch plastic is used around the keyboard and touchpad. The touchpad seems to be overhauled and now feels more stable and accurate, but, on the other hand, also feels a bit stiff. More force needs to be applied to register left or right mouse clicks. But as far as the keyboard goes, there are some small changes that have to be noted. For instance, the “Enter” key is smaller, while the left shift has grown and, unfortunately, there are no media controller buttons… yet again. 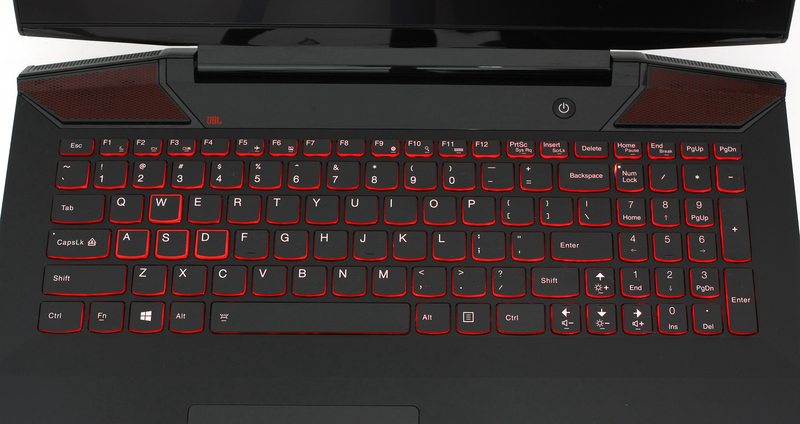 The same AccuType keyboard, but this time with highlighted WASD keys, comes in the Y700. It’s okay, has relatively long key travel, big enough keys, evenly spaced, and a red LED backlight for the whole keyboard. Anyway, the speakers have been changed now, making a small curve, looking bigger and complimenting the design signature all-around. We’d say we are mostly happy with the design changes compared to the previous version. The design of the cooling system is now much better because the hot air from the main exhaust vent is not obstructed by the screen hinge. The bottom aluminum piece seamlessly “connects” with the plastic vent and matte plastic interior, so there are no more sharp edges and inconsistencies. 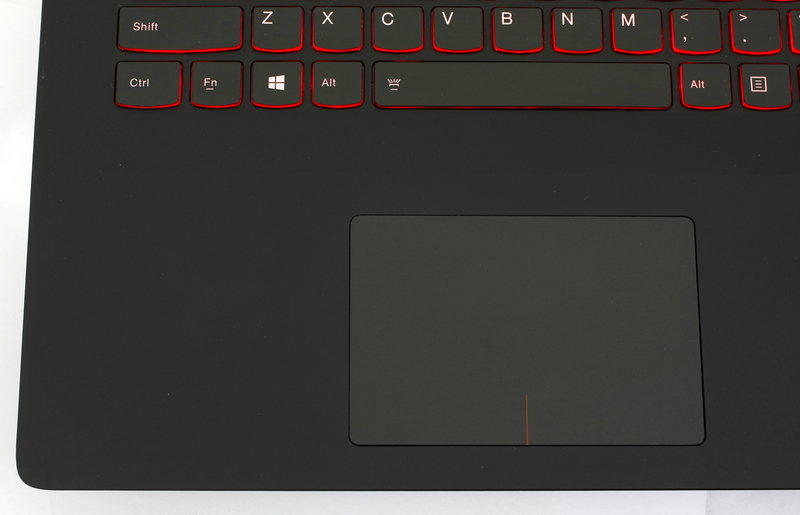 Also the palm rest is now bigger and the touchpad has been slightly improved, so despite the more weight and thicker profile when compared to its predecessor, the Y700 has a nifty, aggressive and sleek design. Lenovo Y700’s display uses a Full HD IPS (or PLS, as Samsung likes to call it) panel with a model number of LTN156HL09-401. The display has a 15.6-inch diagonal, resolution of 1920 x 1080, pixel density of 141 ppi, and pixel pitch of 0.18 x 0.18 mm. The screen can be considered “Retina” if viewed from a distance equal to or greater than 61 cm. Viewing angles are excellent as you can see from the image below. The shots were taken at a 45-degree angle. The maximum brightness we were able to register is 218 cd/m2, with a maximum deviation of 13%. The color temperature is 6715K, and it’s pretty close to the 6500K optimal. You can see in the yellow triangle below that the Lenovo Y700’s screen covers only 52% of the sRGB color gamut. We used the X-Rite i1Display Pro for hardware calibration. We tested the display using 24 commonly used sample colors like skin tones, grass, blue sky, orange etc. After profiling, the display had an average DeltaE 2000 deviation of only 1.05, while the contrast was 1000:1 before calibration and 850:1 after. Excellent results. Just like the Alienware 15 R2, the Lenovo Y700’s panel flickers only below 58 cd/m2 screen brightness. Anything below this value is virtually impossible to use, so we consider the display to be user-friendly. Nevertheless, we strongly advise that you keep the brightness above 59%, as the frequency of the emitted light is 200 Hz and it’s quite harmful. We are again left with something more to be desired from the screen quality. It’s not a big improvement, or, to be honest, any improvement at all, compared to the last generation Y50. We’ve got low sRGB color gamut coverage and low maximum brightness. This means that half of the colors aren’t reproduced and the low brightness might result in poor screen performance if the notebook is near a window or under strong light source (daylight included). Yet, we have high contrast ratio, close to optimal color temperature and excellent viewing angles. Also, the screen flickers only below 59% (or 58 cd/m2) brightness – the value below which the screen becomes practically unusable at normal surrounding environment. We don’t have any complaints about the sound quality as it’s rich, clear and full, thanks to the subwoofer at the bottom of the machine and the JBL-branded stereo loudspeakers. Last year the Y50 offered a decent battery life provided by a 4-cell 53Wh battery, but this time around we’ve got a 60Wh one. This slight increase in battery capacity and the slight decrease of TDP of the CPU will surely improve the endurance of the machine. But, by how much? You will find out in our three regular tests – Wi-Fi Web surfing, video playback, and gaming. All of the tests are conducted with the same settings – power saver mode is on, Wi-Fi is turned on, and screen brightness is set to 120 cd/m2. Great battery performance here – 381 minutes (6 hours and 21 minutes). Similar result, slightly lower, but still way above average for a gaming notebook – 328 minutes (5 hours and 28 minutes). As expected, the gaming test took a toll on the battery with only 150 minutes (2 hours and 30 minutes) of play time. Here you can see an approximate comparison between the CPUs that can be found in the Lenovo ideapad Y700 (15") models on the market. This way you can decide for yourself which Lenovo ideapad Y700 (15") model is the best bang for your buck. The temperature test is maybe one of the most important in our reviews. It doesn’t represent real-life situations, but gives a good glimpse of the stability of the system in the long run. And, of course, that’s the best way to assess the cooling system. The first phase of the test is 100% CPU load for at least an hour. The Lenovo Y700 keeps things cool when idle (29-31 °C) and when under heavy load (76-68 °C). Also, the chip was constantly running at 3.1 GHz and this is the maximum operating frequency for the Core i7-6700HQ CPU when all four cores are active. You can see the temperatures indicated by the red graph, while the green one represents the CPU load. 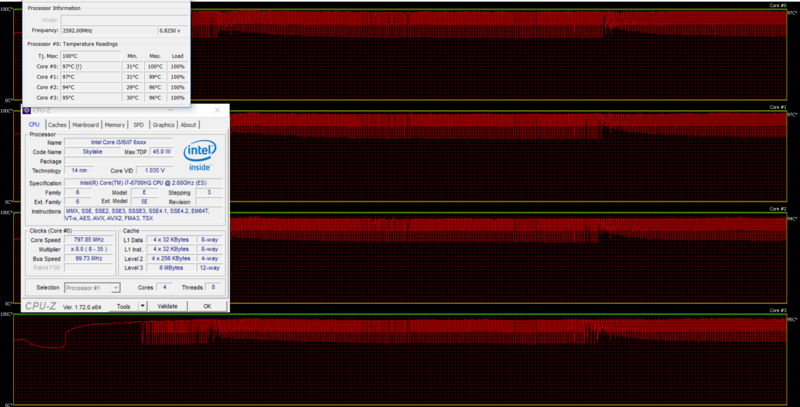 After an hour, we started the GPU stress test and it didn’t take long for things to change dramatically. The temperature of the silicon rose to 98-99 °C, with 100 °C being the maximum allowed operating frequency. 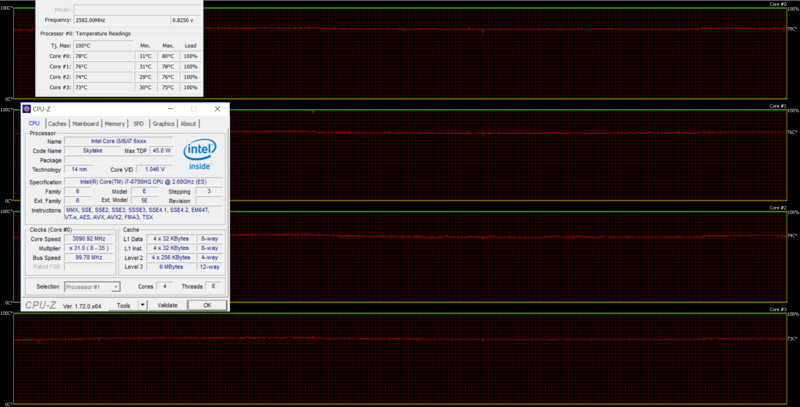 As a result, the CPU started throttling at 800 MHz in order to keep things below 100 °C. We encountered the same scenario with the first Y50 model with Core i7-4710HQ, but interestingly enough, the throttling issue wasn’t present with the Core i7-4720HQ + GTX 960M configuration. The GPU, however, didn’t suffer from the excessive heat and its performance wasn’t crippled. Last year the Y50 didn’t exactly offer the desired cooling capabilities, but the Y700 does a better, yet still not good enough job keeping the internals cool. As we’ve already mentioned, we should note that this is a synthetic test that represents an unlikely set-up in terms of everyday usage. The heat map below shows a little improvement, perhaps caused by the change of position of the cooling vents, compared to the old Y50. But this time the heat is mostly concentrated on the right and top side of the machine. The palm rest area remained cool throughout the test. 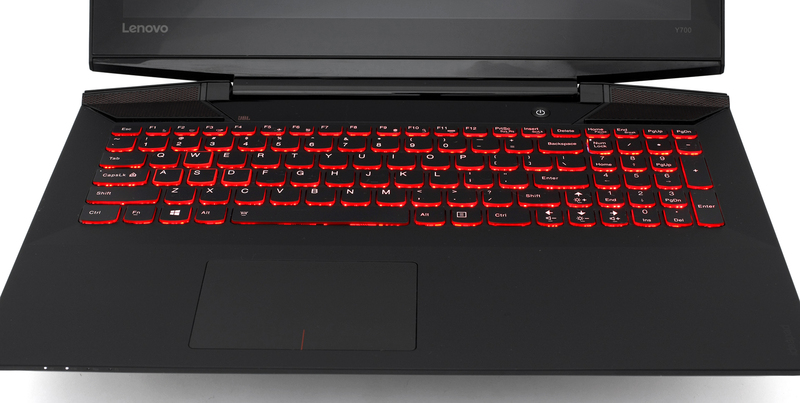 The Y700 offers the same sturdy, premium design with slight improvements around the edges, despite the ~200 g increase in weight and the slight thickness bump. They are hardly noticeable, so don’t worry about that. We are still giving it an A+ in the design department. Also, the palm rest area is now slightly bigger and the touchpad has received a small update, which now eliminates the so-called annoying wobbling effect. Much better than before, although the mouse clicks feel a bit stiff. Getting used to it just takes time. On the hardware front, things haven’t changed a lot. We still have the GTX 960M GPU on board, but this time paired with the newer Skylake Core i7-6700HQ CPU, DDR4-2133 RAM and a slightly bigger battery. Speaking of, the latter resulted in a huge battery life increase, but we suspect that the new power saving features of the Skylake CPU are mostly to blame. And finally, Lenovo has added an M.2 SATA SSD slot for extra storage space. A long-awaited upgrade, ever since the first Y50 came out. The IPS panel used for the touch version that we have has relatively low maximum brightness and low sRGB color gamut coverage. The latter could turn out to be an advantage if you don’t use the notebook for web/graphic design tasks, because the reduced blue light makes the screen more eye-friendly. Yet, we are pleased with the contrast ratio, viewing angles and the fact that the panel doesn’t use PWM above 58 cd/m2 (59%). Keep in mind that these tests were performed on the touch-enabled variant of the notebook. Also note that anything below 80 cd/m2 is somewhat unusable, so you’ve practically got a PWM-free display. 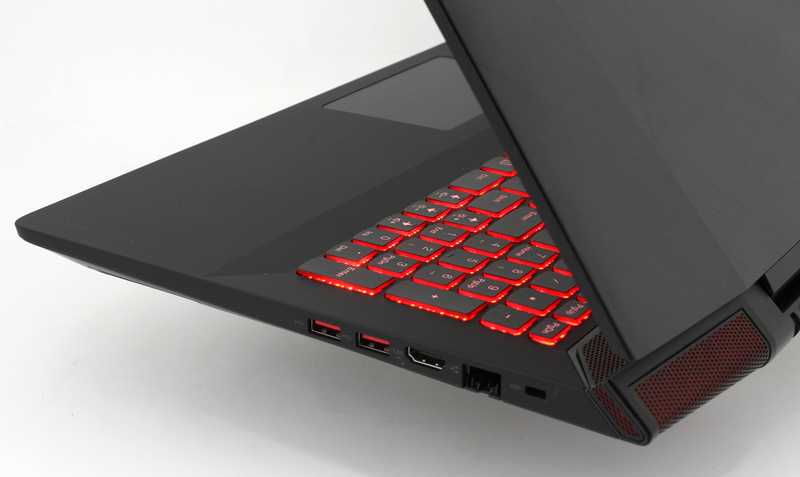 At the end of the day, Lenovo Y700 remains one of the best balanced choices for a mid-range gaming notebook. I’m going to be studying engineering next year and am wondering if this laptop would be sufficient. Does anyone know if the Y700 is capable of smoothly running those kind of programs and software? Can you confirm if the laptop (15.6 inch ) is heavy and is the screen badly reflective? 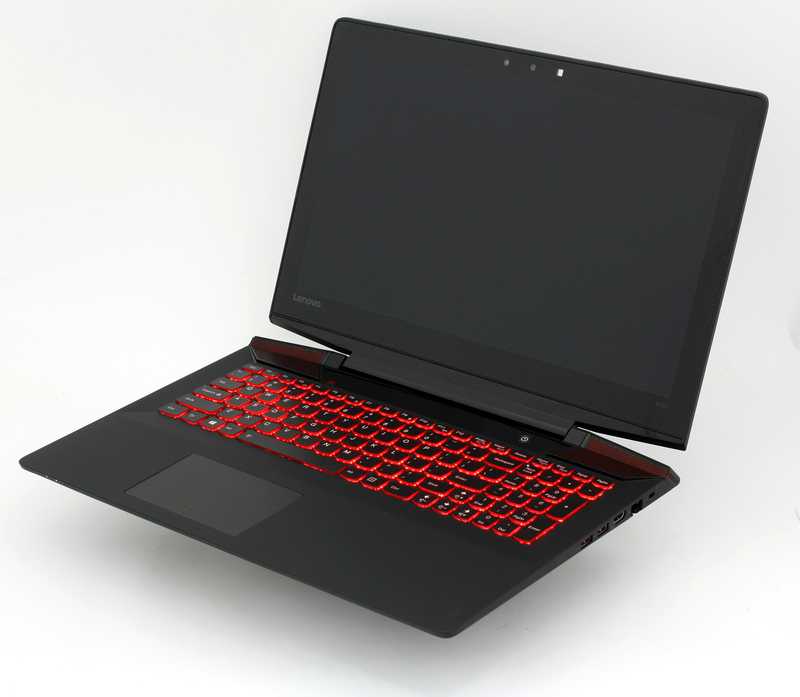 I am stuck between this laptop, 2016 HP Omen and Acer V Nitro is this the best one? Do you guys know what are the best settings for calibrating the y700 15ISK’s screen, using only the Intel Graphics program?